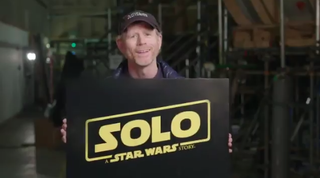 Lest you forgot that Ron Howard has been working overtime (cheerfully and without complaint, one assumes) to finish the previously-untitled “young Han Solo movie” after previous directors Phil Lord and Chris Miller dropped out in an improv-related scuffle with producer and final authority on all things Star Wars Kathleen Kennedy—well, he has. Until this morning, when Howard took to Twitter to say that filming on the movie is complete, and to reveal the title of the film: Solo: A Star Wars Story. Now Howard just has to guide the movie through a presumably intense, effects-heavy post-production process before Solo: A Star Wars Story hits theaters on May 25, 2018. Good luck, Opie! Anyway, feel free to workshop your “Flyin’ Solo,” “Red Solo Cup” (a reference that made its way into the film’s working title), and “Sweet Guitar Solo” jokes below.